A4 Size 7.3 x 10 in. (186 x 253 mm) 8.3 x 11.7 in. A4 Mounted 7.3 x 10 in. (186 x 253 mm) 11 x 14 in. (272 x 376 mm) 11.7 x 16.5 in. MEDIUM 15.25 x 20.8 in. (387 x 528 mm) 19 x 24 in. Manjushri, the bodhisattva of wisdom, is venerated in Nepal as the enlightened being who brought all knowledge, skill and learning to the Kathmandu Valley. Manjushri first came to Nepal from his 'five-peaked' mountain abode of Wutai Shan in China, bringing his two consorts and many of his disciples with him. At this time the valley of Nepal was submerged beneath the waters of a great lake known as Kalirada, so with his sword Manjushri cleaved a gorge through the surrounding southern hills, thus enabling the lake's receding waters to drain south towards India. Manjushri then founded the town of Manjupattana in this now fertile valley, enthroning his disciple, Dharmankara, as the first king of Nepal. Here Manjushri is shown dancing with his two wives upon a communal throne. Manjushri is youthful and golden-orange in colour, and he stands in bow-and-arrow posture upon a moon disc and a pink lotus. He wears the divine silks and eight jeweled ornaments of a bodhisattva, and his gentle and sweetly smiling face has two bow-shaped eyes. With his right hand he wields aloft his fiery wisdom sword, which is known as chandrahasa, meaning 'moon-deriding'. And with his left hand he holds the stem of an immaculate lotus in front of his heart, which blossoms at the level of his ear and bears the text of the 'Perfection of Wisdom' (Prajnaparamita-sutra) upon its seed-head. 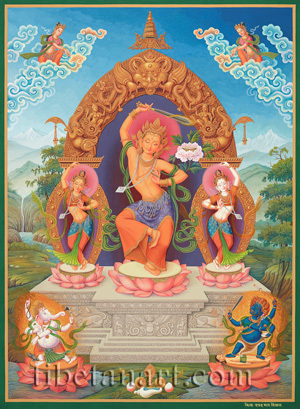 Dancing upon the lotuses to Manjushri's right and left are his two consorts, Kesini and Upakesini, who are also known as Varada and Mokshada. Kesini is golden-orange in colour and Upakesini is white, and they both wear the divine silk garments and the Newar ornaments of a kumari or young goddess. The ornate stone throne upon which these three bodhisattvas dance is adorned with the image of a serpent-devouring garuda on its central façade, with the emblems of an elephant and garuda-lion (gaja-simha) adorning it symmetrical corner pillars. Two roaring lions appear on the façade's outer panels, and the upper plinth of the throne is decorated with scrolling roundels that contain the small images of swans. Above the scrolling golden auras of Kesini and Upakesini appears the golden arch of Manjushri's upper torana. Two ferocious makaras stand upon the capitals of the pillars that ascend behind Manjushri's consorts, with each makara having a crescent-shaped crest that protrudes from its mouth, from which hang two chained golden bells. Two goddesses that hold a skull-cup (left) and a water-pot (right) stand above the scrolling tails of the makaras, and above these are two jewel-grasping dragons. The large head of kirtimukha crowns the torana, with his two feathered hands feeding serpents into his mouth, and his horned and wrathful three-eyed face is crowned with the emblems of a crescent moon and a jewel. Floating above the top of the torana is a golden parasol with three ornate eight-sided wheels, a crowning pinnacle or gajur, and flowing silks that hang beneath its base. Amidst the billowing clouds in the upper sky are two offering goddesses, who each hold flowers in their cupped hands. In the lower left and right corners are the four-armed forms of dancing white Ganesh and black Bhairava, who each stand upon a golden sun disc and a pink lotus amidst a blazing mass of wisdom fire. Ganesh holds a white radish and a rudraksha bead rosary in his two right hands, and with his two left hands he makes the elephant-hand (gaja-hasta) gesture and holds an axe. Ganesh's grey shrew vehicle appears behind his right foot. Bhairava is blue-black in colour and stands in alidha posture upon a stiff male corpse. He wears a tiger-skin loincloth, golden ornaments, a five-skull crown, and a chained golden garland of severed heads. With his first pair of hands he holds a curved knife above a skull-cup, while with his second pair he wields aloft a sword and a khatvanga. The background landscape of this composition shows the receding waters of the great lake cascading through the cleft at Chobar Gorge as they flow towards India. The Himalayan peaks appear in the far distance, and between the two pools at the bottom centre is an offering of the five sense objects: a mirror (sight), cymbals (sound), a conch filled with perfume (smell), jewel-fruit (taste), and a silk ribbon (touch).